Yet Jordan is also Palestine. 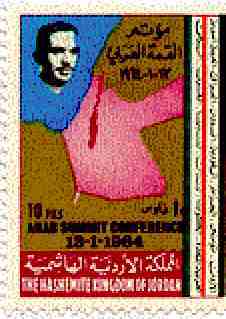 Here are two Jordanian State Stamps one from 1964, bearing the likeness of King Hussein and pictures Mandated Palestine as an undivided territory [All of Israel of today plus Jordan of today]..., the other a 1949 stamp pictures King Abdullah of the kingdom of Jordan and bears the label of Palestine in English and Arabic. capable of supporting a large population if irrigated and cultivated scientifically. ... The Zionists have as much right to this no-man's land as the Arabs, or more. That there be established a separate state of Palestine.... placed under Great Britain as a mandatory of the League of Nations ... that the Jews be invited to return to Palestine and settle there.... and being further assured that it will be the policy of the League of Nations to recognize Palestine as a Jewish state as soon as it is a Jewish state in fact. . . . England, as mandatory, can be relied on to give the Jews the privileged position they should have without sacrificing the [religious and property] rights of non-Jews. The Arabs of that day achieved independent Arab statehood in various lands around Palestine but not within Palestine itself Sovereignty was granted after World War I to the Arabs in Syria and Iraq; in addition, Saudi Arabia consisted of approximately 865,000 square miles of territory that was designated as "purely Arab"
Considering all the "territories" that had been given to the Arabs, Lord Balfour "hoped" that the "small notch" of Palestine east and west of the Jordan River, which was "being given" to the Jewish people, would not be "grudged" to them by Arab leaders . Further explanation was found in a "secret dispatch from Chief British Representative at Amman" later in 1921. He cautioned that the local "Transjordanian Cabinet" had been replaced by a "Board of Secretaries,"
Syrian exiles, who with perhaps one exception, are more interested in designs on the French in Syria than in developing Trans-Jordania.... In his Highness' opinion, the allies had not dealt fairly with the Arab nation and Great Britain had not treated him as he deserved. He was one of the most chiefly instrumental in bringing about the Arab revolution and when Feisal, during the war, was inclined to accept the overtures of the Turks he had opposed that policy.... When he came to Trans-Jordania "with the consent of the British", he had agreed to act in accordance with Mr. Churchill's wishes and with British policy, as he did not wish to be the cause of any friction between the British and their allies, the French. ... The allies had not dealt fairly with the Arabs because, whereas they had agreed to form one Arab nation, forming different Arab states, and even in Syria, as small as it is, they had divided that country into six or seven states. He had come to Trans-Jordania hoping for great things and now he realized that he had no hope either north or east. If he went back from here to the Hejaz, he would look ridiculous. We do not expect or particularly desire, indeed, Abdullah himself to undertake the Governorship. He will, as the Cabinet rightly apprehend, almost certainly think it too small.... The actual solution which we have always had in mind and for which I shall work is that which you described as follows: while preserving Arab character of area and administration to treat it as an Arab province or adjunct of Palestine. (1) the Arab governor mutually agreed upon by his majesty's government and Abdullah or King Hussein. (2) British officer(s) to have real control. (3) Reserve force commanded by British officer(s), Air Force and armored cars as at present. (4) A small British garrison to be stationed in District temporarily. (5) A declaration in accordance with new article to be inserted in mandate that Jewish National Home provisions do not apply east of Jordan. This would not prevent such Jewish immigration as political and economic conditions allowed but without special encouragement by Government. Feisal got his wishes and became King of Iraq; his brother Abdullah was installed in the British mandatory area as ruler of the "temporary" emirate on the land of eastern Palestine, which became known as the "Kingdom of Transjordan." Britain nevertheless quietly gouged out roughly three-fourths of the Palestine territory mandated for the Jewish homeland15 into an Arab emirate, Transjordan,16 while the Mandate ostensibly remained in force but in violation of its terms.17 Historians and official government documents concerned with the area continued to call it "Eastern Palestine," despite the new appellation. That seventy-five percent of the Palestine mandate was described by England's envoy to Eastern Palestine:18 "a reserve of land for use in the resettlement of Arabs [from Western Palestine], once the National Home for the Jews in Palestine"* resulted in the "Jewish independent state." The League of Nations Mandate for Palestine remained unchanged even though Britain had unilaterally altered its map and its purpose. The Mandate included Transjordan until 1946, when that land was declared an independent state. Transjordan had finally become the de jure Arab state in Palestine just two years before Israel gained its Jewish statehood in the remaining one-quarter of Palestine; Transjordan comprised nearly 38,000 square miles; Israel, less than 8,000 square miles. We are the army of Palestine.... the overwhelming majority of the Palestine Arabs ... are living in Jordan. Yasser Arafat has stated that Jordan is Palestine. Other Arab leaders, even King Hussein and Prince Hassan of Jordan, from time to time have affirmed that "Palestine is Jordan and Jordan is Palestine." Moreover, in 1970-1971, later called the "Black September" period, when King Hussein waged war against Yasser Arafat's Arab PLO forces, who had been operating freely in Jordan until then, it was considered not an invasion of foreign terrorists but a civil war. It was "a final crackdown" against those of "his people"26 whom he accused of trying to establish a separate Palestinian state, under Arab Palestinian rule instead of his own, "criminals and conspirators who use the commando movement to disguise their treasonable plots," to "destroy the unity of the Jordanian and Palestinian people." Indeed, the "native soil" of Arab and Jewish "Palestines" each gained independence within the same two-year period, Transjordan in 1946 and Israel in 1948. Yet today, in references to the "Palestine" conflict, even the most serious expositions of the problem refer to Palestine as though it consisted only of Israel —— as in the statement, "In 1948 Palestine became Israel." The term "Israel" is commonly used as if it were the sum total of "Palestine." However, within what Lord Balfour had referred to as that "small notch" sometimes called Palestine, the "Jewish National Home" had been split into two separate unequal Palestines: Eastern Palestine-or the Arab emirate of Transjordan-and Western Palestine, which comprised less than one-fourth of the League of Nations Mandate. The portion of the "notch" of land on which the Jews settlod and in which most Jews actually lived —— from the 1870s and 1880s through the 1940s —— was in fact only a segment of the area of Western Palestine. If Israel must give up a portion, or all of WEST BANK land, which was part of the British Mandated "Palestine" or Jewish National Home, it is only logical that Jordan must give up a proportiately large amount of EAST BANK land which was also part of the British Mandated "Palestine" or Jewish National Home. Israeli Central Bureau of Statistics estimates of Palestinians in Israel (http://www.cbs.gov.il/shnaton/st02-01.gif). Palestinians are by law guaranteed the RIGHT OF RETURN to Jordan, where they are entitled to citizenship, "unless they are Jews." Jordan is very much afraid that it will be declared THE PALESTINIAN STATE, Jordan has NEVER allowed publication of the percentage of Palestinians in its population. Jordan is also afraid that someone might suggest to take a portion of its territory for a Palestinian state. MORE THAN TWICE the number of Palestinians live on the EAST BANK of the Jordan River in Jordanian territory, than live on the WEST BANK.